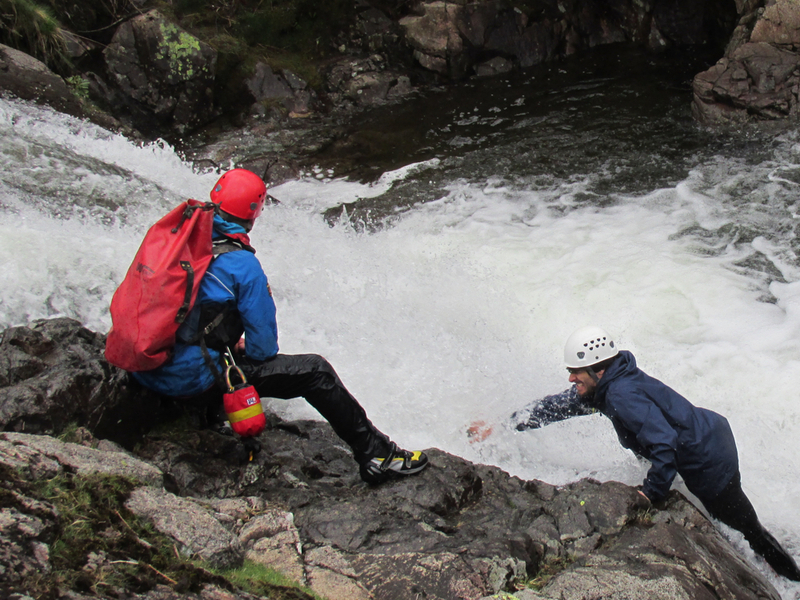 How to explain Ghyll Scrambling: One of the most natural activities that can be done in the mountain environment. Climbing, and Scrambling over obstacles to gain hight. It is difficult to describe but everyone loves it. Basically with just a Helmet and Jacket you set out from the bottom of the river and work your way to the top. Sometimes there is a need to climb with hands and feet, Sometimes there is a need to climb around a deep pool - that you may or may not fall into, and sometimes there is a need to leap into a pool (all strictly necessary of course). On a Full Day we take it up a notch and pack harnesses and ropes, allowing us to climb directly up the waterfalls rather than skirting round. Exhilarating and fun, our instructors love instructing it because playing in the stream never gets old. 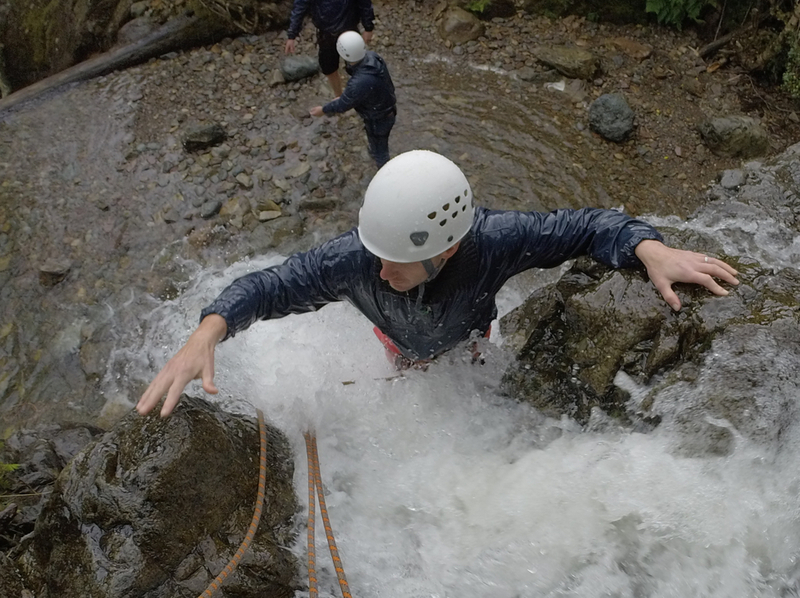 Ghyll Scrambling vs’ Gorge Walking vs’ Canyoning To be honest there are more similarities than differences. They are all activities in fast-flowing mountain water, all wet and all involve jumping. Gorge Walking: Deep Gorges are not the Lake Districts natural environment - they tend to be deep ravines with not many waterfalls and involve a lot of actual swimming. After around 2 miles turn right onto the A5084 signposted Coniston and Torver. Follow this road for around 6 miles to the T-Junction at the end of the road at Torver. Turn right signposted Coniston A593. Follow for around 7.5 miles to Skelwith Bridge. Just over the bridge take the left turn signposted Elterwater and Langdale. Continue for around 4 miles. The Sticklebarn Tavern is on your right go past the main entrance to the next entrance on the right; park in the National Trust Car Park which is surrounded by trees. Head north on the A591 towards Ambleside. At the traffic lights by the pet shop turn left (signed Keswick, Coniston, Langdale) alongside the lake and into the 20mph zone. Follow this round around and take the first left signed A593 Coniston, Hawskhead, Langdale. Follow the road left over the bridge and continue on the A593 for around 2.2 miles. Turn right at Skelwith Bridge signposted Elterwater and Langdale. The Sticklebarn Tavern is on your right go past the main entrance to the next entrance on the right; park in the National Trust Car Park which is surrounded by trees.